Delegates and observers at the 35th SDNU TGA at Imperial Hotel in Kuching. 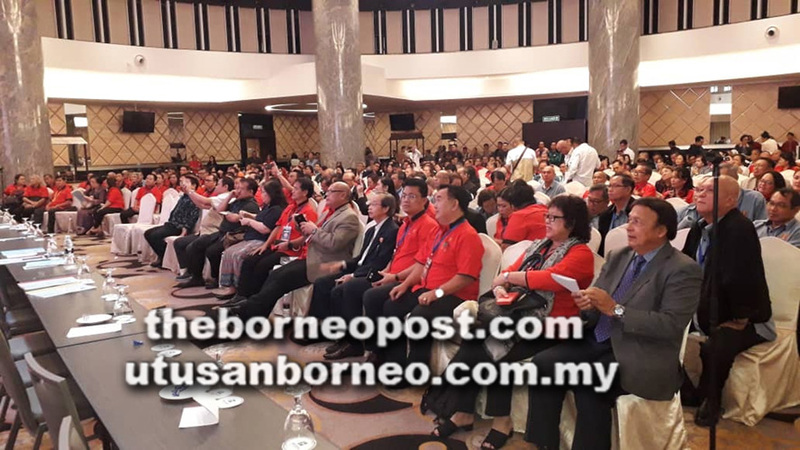 KUCHING: Tan Sri William Mawan Ikom was returned unopposed as Sarawak Dayak National Union (SDNU) president at its 35th TGA held at Imperial Hotel here yesterday. Mawan who is Pakan assemblyman will be in his third term holding the post. He also won uncontested at the last two SDNU triennial general assemblies (TGA). Perhaps the most exciting moment in yesterday’s TGA election for the 2019 – 2021 office bearers was the contest for the deputy president post when Engkilili assemblyman Johnical Rayong Ngipa defeated Army commander Lt Gen Datuk Stephen Mundaw. Rayong, an SDNU member since 1996 did not hide his intention in eyeing for the post since last year. He held roadshows at Skrang in January, Sarikei and Sibu in February and here (Kuching) early this month to canvass for delegates votes. Mundaw, on the other hand was nominated for the senior vice president post but decided to have a go at the deputy president’s post. Former SDNU assistant secretary and lawyer Chambai Lindong won the vice president post (88 votes) in a three-cornered contest. The other candidates for the vice president post were civil servant and former appointed ordinary supreme council member Petrus Ngalih (83 votes) and another civil servant Anthony Banyan (71 votes). The 11 elected ordinary supreme council members are William Baja Jap, Anthony Ugor Nili, Wilfred Mujah Aton, Peter Moni Selat, Jepthre Empali, Pani Igoh, Jeti Kumpai Endawie, Norina Emas, Adi Jala, Henry Banyan and Margaret Bedus. The rest of the elected top tier supreme council members who won uncontested are the two senior vice presidents – Banyi Beriak and Tamin assemblyman Christopher Gira Sambang, secretary-general Harold Unsie Liban and treasurer general Angat Anom Linggoh and well as their respective assistants namely Augustine Merikan and Sebastian Renggian and publicity chief Ganchai Jinta. Women and Youth division chief Dato Alice Jawan and Churchill Edward Drem respectively are automatically vice presidents in the main body. The 63-year-old SDNU held its anniversary celebration on Friday night at Imperial Hotel with Chief Minister Datuk Patinggi Abang Johari Tun Openg officiating.